Try these games and puzzles at home! Ask your SQUIRT to try to show you what we puzzled with today. Last week, and again this week, we played Add it Up. Each player uses his or her own game board. At the start of play, players place one game piece in each square on the board, making sure the numbers on the board can still be seen. Roll the dice to decide who goes first. A player should only remove one combination per roll of the dice. Depending on what pieces are available, a player may have a choice of several combinations. Only combinations that have all the needed pieces on the board can be used. In this example, 4 and 2 cannot be removed if 1 has already been taken off in a previous turn. When there is no combination of open squares left on the player’s board adding up to the sum of the dice rolled, the game is over for that player. The other player can continue to roll and remove pieces until they also roll a combination that they cannot complete, or until they have no more pieces on the board.  The object of the game is to remove as many game pieces as possible. The player with the fewest pieces on the board at the end of the game wins. We investigated rectangular arrays. With square tiles, we made rectangles and squares. We started with one tile. We rolled a ten-sided die to decide how many tiles to ADD. Then, we investigated whether we could still make any squares or rectangles with the new total. This was an investigation of multiplication, of odd and even numbers, and of addition. It was fun! Today we played the game where we had ten counters in a cup, each one red on one side and yellow on the other side. We used a ten-sided die and whoever got closest to the Partners to Ten number rolled won a point.The kids tried to beat me, but lost the first round. They won the second round and so had their revenge. We played a game called SNAP-IT where each student had ten unifix cubes all connected and held their "stick" of cubes behind their back to challenge the person to their left. They SNAPPED IT and brought one part of the ten to the front. The person challenged needed to name the number of cubes left behind the challenger's back. Finally, we played a word problem game that was HARD. They LOVED it! I gave them each two oranges (tens) and they "made" them with any combination of the other rods. Then we used our magnetic circles to create the same number combinations on two ten frames. Next, we played a game where we had ten counters in a cup, each one red on one side and yellow on the other side. Each of the kiddos would hold up a number of their ten fingers, creating a Partner to Ten combination. For example, if they had six fingers up, they would also have four fingers down. Now, we SHAKE the CUP and dump out the counters. Anyone who's fingers matched the yellow to red combination (for example, six reds and four yellows would match the child with six fingers up, AND anyone with four fingers up). Next week, I'm not to forget to play Nine Lines Tic Tac Toe with TWO TEN FRAMES (a TWENTY FRAME), using the TWO's house. We'll make the purple numbers with our magnetic circles in yellow. We'll make the red numbers (the partners to ten) with our magnetic circles in red. Then we'll roll the 9-sided die. Our goal will be to fill in all nine twenty frames as a team. If we roll a ONE, we could fill in the rest of the first TWENTY FRAME (worth 2 in the 2's house) with 18 red magnets, OR fill in the two spaces left on the NINE's TWENTY FRAME (equal to 18 in the 2's house) with yellow magnets. If we roll a number where BOTH partners to twenty are already filled in, we'll have to REMOVE the part we filled in from one of the two TWENTY FRAMES. It will be a difficult task to complete. For more information or for archived descriptions of the work we've done, go to DEB and click on SQUIRTS or MATH on the left hand side. We then played Nine Lines Tic Tac Toe with a TEN FRAME for each number. We made the purple numbers with our magnetic circles in yellow. We made the red numbers (the partners to ten) with out magnetic circles in red. Then we rolled the 9-sided die. Our goal was to fill in all the ten frames as a team. If we rolled a ONE, we could fill in the rest of the ONE's TEN FRAME with NINE red magnets, OR fill in the ONE space left on the NINE's TEN FRAME with yellow magnets. 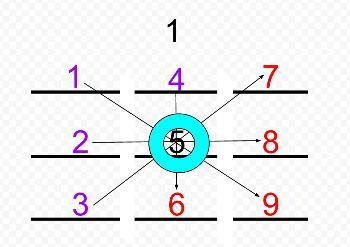 If we rolled a number where BOTH partners to ten were already filled in, we had to REMOVE the partner number from one of the two TEN FRAMES. It was a difficult task to complete. When we had nothing left but the second FIVE of the FIVE's TEN FRAME, I rolled for the win. I was unsuccessful, thus declaring the kids the champions. It was a success, though it was also declared, "Easy Peasy." We looked at a twenty frame and practiced seeing amounts and changed amounts. The kids would replicate what they saw, and we talked about how they knew the amounts without counting. We also looked at how many were left over using partners to ten for each of the two ten frames. We played Race to 100, though everyone decided to work at his own pace, rolling a ten-sided die to keep adding ONES, converting them to tens, and trying to get ten tens (ten French Fries) to trade in for one one hundred (or one toaster waffle). We had one person get to 100 and he had time to investigate what happens when you race back down, doing the hardest conversion from his 100 block. He rolled a five, and needed to remove FIVE ONES (five Cheese Bits). But he didn't have any. He had 100. He realized he could regroup that 100 back to ten tens (or ten French fries). He still couldn't remove FIVE ones, because he still didn't have any ones..He finally realized he could trade a French Fry (a ten) for ten Cheese Bits (ones). At last, he could remove FIVE from his board! For more information or for archived descriptions of the work we've done, go to DEB and click on SQUIRTSor MATH on the left hand side. We worked with counting on from five and did more ten and twenty frame work, with the kids practicing HOW MANY and HOW MANY LEFT to continue to visually understand number, partners to ten, and counting to twenty. The kids explained what they saw and HOW they knew how much it was. For example, this is EIGHT. We can see that it is FIVE and THREE MORE. It needs TWO to make a TEN. They practiced making their own puzzles and quizzed one another and me. We played around with "sneezing" on our hands to make some of our fingers disappear. The idea was to ask our partner how many fingers we lost by seeing how many remained. We also worked on a number line game to find partners to ten. Next, we played a little bit of Race to 100 with base ten blocks. We'll play a bit more of that next time. I will make a movie of this game to post on my Math Page.... soon! We played around with a number line where the kids got to roll a die (with numerals 0-9) and go stand on that spot on the number line. Then we had them add their numbers together with the person next to them and move to the sum, or move to a number greater than six, things like that. 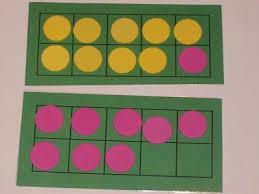 Next, we played around with a Ten Frame with dots so that I could see how comfortable they are with recognizing patterns to know the number of dots rather than counting directly. Finally, we talked about how our brains GROW when we are puzzled, when we make mistakes, and when we talk about our thinking. Next week we'll play Race to 100 with Base Ten Blocks. While half of the SQUIRTS go to MESSY CAMP science with Elana and Justin, I am working through a unit about EMPATHY and EMOTIONAL INTELLIGENCE with the rest of the group. The groups will swap each week. We moved into the second part of our Emotional Intelligence Focus Group and began to investigate impulse control. We talked about ways we control our impulses, and what emotions make it particularly tricky to do that. We talked about how slowing down can almost always help, and that breathing in slowly is a powerful tool for slowing down and gaining control. We looked at a boy in our photo story and imagined what he might be feeling, why, and what problem he needed to solve. As we zoomed out to see more of the scene, we had more information to work with, and we imagined what he might feel or want, what he might say or do next.. We imagined what we might say to him. We also imagined what might happen if he acted impulsively. He got down to eye level with the other children who were digging in the sand. He asked them what they were doing. He said something nice about what they were doing. THEN, he asked if he could play. We talked about how this might be effective, and shared our experiences of how it can feel to want to join in, or to maybe not want someone to join in. We were pretty happy that he got the courage to go over to the other kids, and that it looked like they were willing to let him join in. Finally, we enjoyed the book The Little Mouse, The Red Ripe Strawberry, and the Big Hungry Bear by Audrey and Don Wood. We looked at how his actions came from his emotions, and how the narrator, by telling the Little Mouse about the Big Hungry Bear, got the Little Mouse to share half of his strawberry by acting quickly from fear and nervousness. Mostly, we just loved this perfectly satisfying and lyrical picture book. And, we all wanted strawberries! We took time to write in Buddy Journals to keep the connection between Buddy Days. Next Buddy Day is at Santa Cruz Gymnastics Center on December 18 from 11:30 -1:00.
and the other is about changing your feelings or your intentions, doing the right thing even when you've been treated badly, and also that people are not always what they seem to be at first. Even enemies can become close friends! While half of the SQUIRTS go to MESSY CAMP science with Elana and Justin, I am working through a unit about EMPATHY with the rest of the group. They will swap each week. October 27 & November 3, Weeks #5-6: We investigated more photos of kids with different reactions to events, including different reactions to something scary, getting angry because someone took something or wouldn't share, small moments of conflict. We also looked at overcoming fear, learning new skills, and trying new things.The kids enjoyed trying to imagine what the children were feeling, what was going on, relating the scene to their own lives. Some of the kids played a game where they face each other and study everything, then turn their backs and make small changes, turn back and try to notice the small changes. We ran short of time today, though for the next group we might visit Arnold Lobel's Frog and Toad for a similar story of friendship. Weeks #3-4: We'll investigate FEELINGS. What happens when two people don't feel the same way about something? How can we notice? What might cause the different feelings? When and how might we help if someone feels sad or left out or angry? We'll look at more photos of kids and try to imagine what they are feeling, what's going on. We'll practice what we might say. We'll finish the book How are you Peeling? Foods with Moods and look at Mo Williams' My Friend Is Sad, Gerald is down in the dumps. Piggie is determined to cheer him up by dressing as a cowboy, a clown, and even a robot! 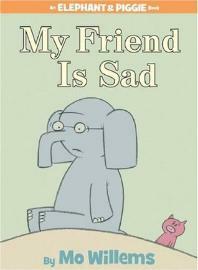 But what does it take to make a sad elephant happy? The answer will make even pessimistic elephants smile. We might visit Arnold Lobel's Frog and Toad for a similar story of friends trying to cheer one another up. Weeks #1-2: We investigated FEELINGS. How do we recognize them? What causes them? How can we help? How fast do emotions happen? How long do they last? We looked at photos of kids and identified the feelings, how we recognized them, what might have happened to the child, what we might do if that were us, or a person in the room with us. We practiced making our own bodies and faces reflect different emotions (happy, sad, mad, surprised, scared, disgusted). We talked about how hard it can be to "fake" emotions, and shared our stories of feelings, of feeling better, of trying to help someone else feel better. We read How are you Peeling? Foods with Moods and had lots of fun imagining what was going on in the photos, and how the artists made fruits and vegetables look so completely convincing no matter the feeling.